I’ve always been lousy at it. Even when I give my boys a job to do, I’m usually not happy with the way they’ve done it and I just do it over myself. Oh, hold on. I just slipped into fantasyland for a minute there. My boys don’t do the jobs I give them! So I don’t bother. 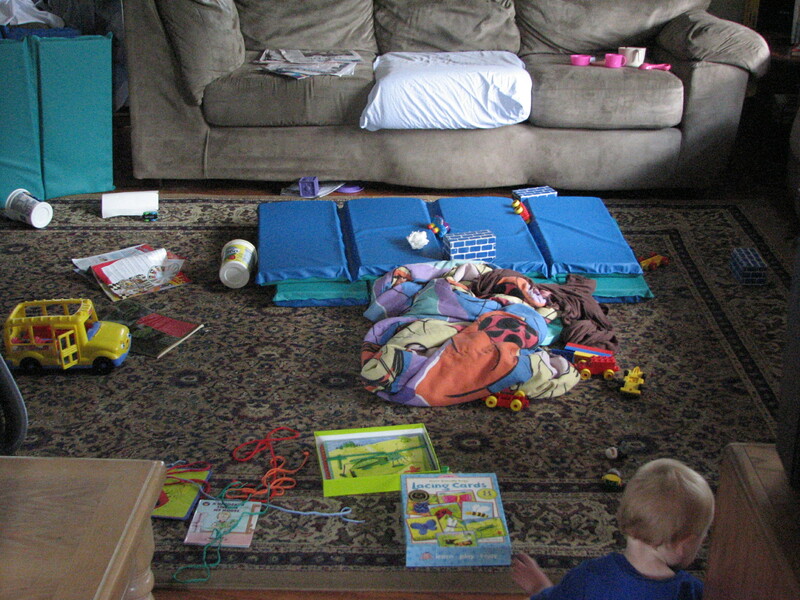 I spend a lot of time cleaning up after all the kids because it’s easier to do it myself than use up my energy trying to get them to do it. My past attempts have included having them sit at the table while I clean up (“But if you help me it’ll go faster and we can get outside!”), giving stickers and prizes for helpers, or trying to make a game of it (“Who can find a blue car?”). None of these lasted, and I never found that magic way to motivate kids to help me with the drudgery. As usual, my mentors do this better than me. They seem to know what toy every child is playing with and see when the child walks away. “Miss A, are you done with that puzzle? Is that where it belongs?” When they are in my home the place is spotless. I have no idea how they do it. So this has always been my weakness and I don’t see it changing any time soon. I’ve gotten a lot of response from providers who have their own kids in care and it seems we have a lot in common. My boys are the oldest so naturally they become the leaders, and they don’t do a great job of inspiring the rest of the troops. When I ask my mentors for advice on this, they all tell me they waited until their kids were grown to open a child care program. Such is my luck. So as I face a long summer of caring for a lot of kids and long days where I rarely sit down and my feet are aching and every morning comes too soon, I’m formulating as many strategies as I can. I’m working on my oldest girl, Miss R, who loves to be a helper anyway but her favorite jobs involve Windex. Generally I try to keep the chemicals that spray in eyes away from the child care space. Lately I’ve had her helping me set the lunch table, pass the baby his bottle, or keep an eye on him around stairs. All the girls are willing to help me contain the baby. All I have to do is ask and they’re all over it. However, in their excitement to help sometimes the baby gets crushed. So I have to be very tricky in what jobs I pass out, and who I ask to do them. The nice thing is that Younger Son has noticed how much praise I lavish on my helpers and maybe it wouldn’t be so bad for him to get a little of that lovin. The other day at lunch we had butter pasta, which I’m ashamed to say is exactly what it sounds like (I serve it with vegetables! And milk!). While I was doing the 100 things I have to do at lunch, Younger decided to help me by dishing out the pasta. I keep the salt and shaky cheese (parmesan) out of reach of the littles because they’ll be covered with buttery fingerprints if I leave them on the table. A better provider than I might allow it, but I have enough to clean up at the end of the day (isn’t that the whole point of this post?). Now if I could only make all the jobs as fun as shaky cheese. This entry was posted in Child Care and tagged having my own kids in care, housework, summer care by Amy Pybus. Bookmark the permalink. Amy, don’t feed them, or let them go outside, or join the activity, until the floor is picked up, sure, sometimes all the blocks get shoved into the car box, but it’s amazing what they can do when they want something!